Gamblogger: Videos Following Intertops Poker Players at the European Poker Championship Coming Soon! Videos Following Intertops Poker Players at the European Poker Championship Coming Soon! Big week coming up for a group of online satellite tournament winners from Intertops Poker and Juicy Stakes Poker! They each won a $4000 prize package to play in the prestigious Main Event of the European Poker Championship in Velden, Austria. Video reports from the tournament, featuring interviews with the players, will be online beginning July 27th. The online poker players each won their €2700 buy-in to the EPC main event (July 27th to 30th), accommodation at a premium hotel close to the casino and cash for travel expenses. Players from all over Europe (especially Germany and Italy) will play tournaments and cash games on more than 40 tables at the exclusive lakeside resort. This year the prize pool is estimated to be over €700,000 (over $770,000). Videos from Velden, Austria begin July 27th. 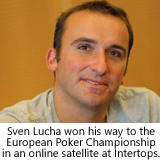 Sven, one of the online poker champions on the Intertops team, is a German tennis coach. He plays mostly online but has played a few live tournaments -- smaller tourneys, not big buy-ins. This is his second European Poker Championship and he looks forward to returning to the Austrian spa resort for another poker holiday. Every day Intertops Poker and Juicy Stakes host a variety of online poker tournaments including three daily free rolls and the $1500 GTD Sundowner at 7:15 Eastern every evening. This weekend the hot ticket is the Sunday Six Max six-handed tournaments series $200 GTD, $550 GTD or $1200 GTD. Sunday Six Max details are available at: https://poker.intertops.eu/en/promo/168-the-sunday-six-max and https://www.juicystakes.eu/promotions/sunday-six-max. You can register for any of these tournaments under the Tournaments tab in the poker software.